He’s going to be ok, Canucks fans. When Brock Boeser was sent barreling into the door opening at the Canucks’ bench in Monday night’s game against the New York Islanders, it put a scare into everyone associated with the team. 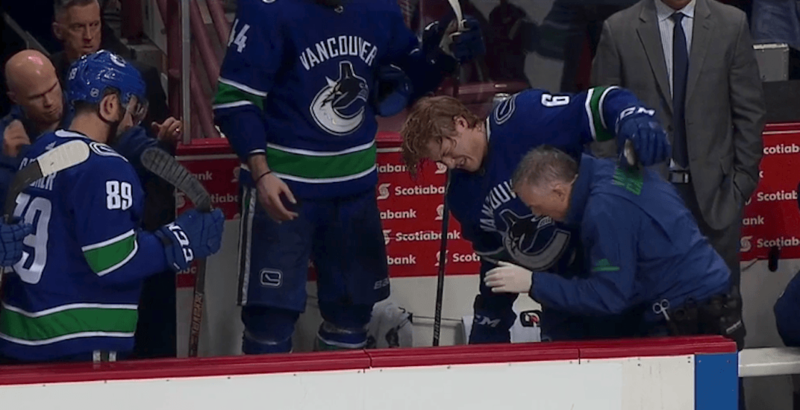 Grasping his hip/tailbone area immediately, Boeser was clearly in a lot of pain as he left the ice. Unable to put any weight on his left leg, a stretcher was sent into the Canucks’ dressing room and the prized 21-year-old star rookie was sent to the hospital. Broken hip? Injured spine? You couldn’t help but fear the worst. Luckily, the worst-case scenario did not materialize. The Canucks announced on Tuesday that Boeser will make a full recovery in 4-6 weeks. With the final game of the regular season on April 7 – just four and a half weeks away – there’s a strong likelihood that Boeser has played his last game in 2017-18. If he returns in exactly four weeks, he would play in just three more games this season. The dream of Boeser winning the Calder Trophy, as the league’s Rookie of the Year, is all but dead. While he’s having a fine season, Boeser trails the Islanders’ Mathew Barzal by 14 points in the rookie scoring race. It also appears unlikely that Boeser will break Pavel Bure’s single-season Canucks rookie records for goals (34) and points (60). Boeser has 29 goals and 55 points to lead all Canucks players this season. While he’ll probably still end up leading the team in goals, there’s a chance that the Canucks’ points leader at season’s end will be someone named Sedin – as Daniel trails Boeser by just nine points. Henrik trails by 12. Thankfully, Boeser’s injury won’t plague him throughout the offseason – a time when young players build up strength to prepare for the next year. If he’s able to return to the ice in April, he will have the option of representing the United States at the World Hockey Championships in Denmark.